One after the other, as their names are called, John Cormack and Ed Schaub slowly approach the Cathedral altar. There, they receive the Book of the Gospel from the Bishop James Wall. With the eyes of friends, families, and strangers on them, these men are officially ordained deacons for the Diocese of Gallup. Cormack will only spend a short time as a deacon, as this marks the final year of preparation before his ordination as a priest in 2017. 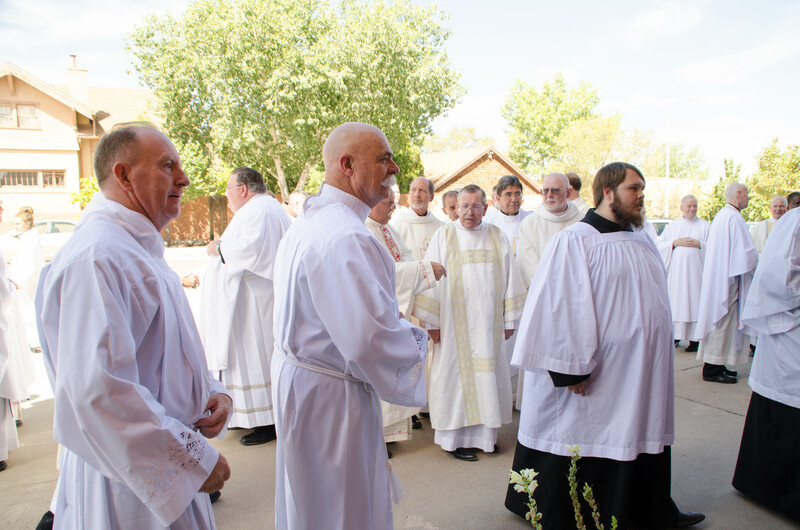 For Schaub, this is the culmination of four years of intense preparation – he will be a permanent deacon, and return to serve his small community in southern New Mexico. Ed Schaub, left, and John Cormack, right, kneel during their ordination. Neither man had an easy path to this ordination. For some, the call to a vocation is heard early and followed directly. But Cormack and Schaub each had to find their way first to a vocation, and then to the Gallup diocese. They came from outside its borders, finding their journey’s end after long years of searching. Perhaps the first thing you notice about Cormack is his accent. Born and raised in County Mayo, Ireland, his accent is strong – his words quick and lilting. “I always tell people I’m from here. I say ‘Can’t you tell? I’m from the Navajo tribe!’ and they say ‘No, you’re not!’” he laughs. He had been studying for the priesthood for the Society of Our Lady of the Most Holy Trinity, an international group, but discerned that he was being called to serve in a different capacity. He still wanted to pursue the priesthood, but where to go? Eventually a friend told him of the need for priests in the Diocese of Gallup. After a meeting with Bishop Wall and several months of acclimating to life in the diocese, Cormack decided to stay, and was officially accepted into the vocations program in December of 2015. He refers to himself multiple times as “blessed”. But the Diocese of Gallup is a long way from Ireland, and the culture and environment where he grew up. For many people, that kind of lifestyle change would be too taxing, but not Cormack. Indeed, it would be hard to refer to Cormack as anything other than a “glass half-full” kind of guy. Constantly smiling, greeting people, or engaging in small jokes, he projects an air of quiet enthusiasm. Again and again, he mentions the people he’s met, the connections made within the community. 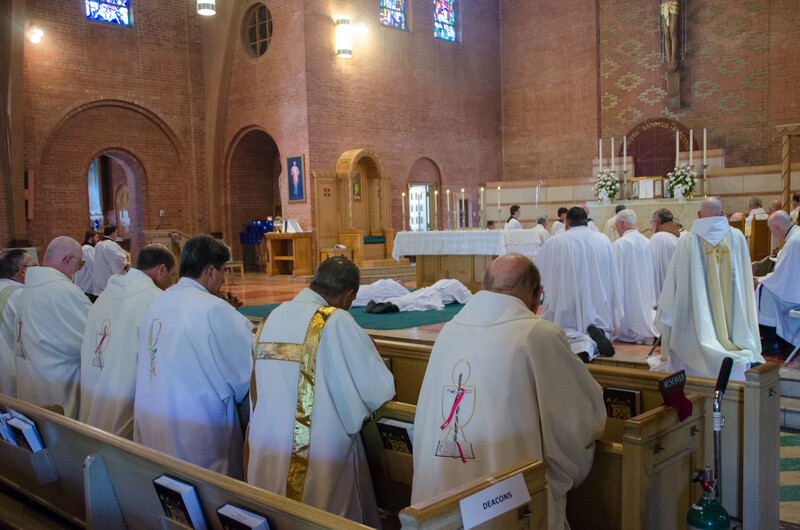 Deacons of the Diocese, foreground, look on during the ordination of two men, who are about to join their ranks. Ed Schaub was already familiar with the culture of New Mexico, having been raised near Albuquerque, and now living along the National Forests and ranching communities near Silver City. He too is full of a peaceful sort of happiness, despite the suffering that marked much of his early life. As a young child he lost his father to a long, lingering bout of tuberculosis. He and his wife left the Church for many years, but slowly found their faith again, in part because of the love and prayers of some women in his life. “Probably about 15 years ago, one of my youngest sisters and her daughters – they’re a bunch of women warriors, man they’re awesome – they kept praying for me and got us back to church,” Schaub recalls. He began to meet with a spiritual advisor, who slowly reacquainted him with his faith. But his sister wasn’t done yet – she had one more seed to plant. He knew that a priestly vocation was unlikely, calling his wife of 43 years his “best friend”. But a call to be a deacon? He considered it, slowly, and finally worked up the courage to apply in the Diocese of Las Cruces, where he lives, just over the border from the Diocese of Gallup. But this proved difficult – partly because of his age. When he applied, he was in his 60s. He tried in the Diocese of Tucson, with similar luck, never getting a clear answer one way or the other. Then came four years of college-level courses in theology and philosophy. “I was an engineer, a mechanical engineer. I’ve got a good mind, but I hadn’t had to study philosophy and theology. It was incredible difficult for me because I’m old.” He gives a hearty laugh. Down in the southernmost reaches of the Diocese, the nearest parish to Schaub is Glenwood, a tiny mission of the parishes at Reserve and Aragon, over an hour’s drive from Schaub’s home. Serving this community won’t be easily because of the vast distances, but Schaub draws on the close friendships and community of the people who live there, Catholic, Mormon, Protestant or otherwise. When he told his neighbors he was pursuing the vocation of a deacon, they expressed nothing but excitement, even if they didn’t necessarily know was a deacon was. “What the call of a deacon should be is service to his neighbor. This community lives that. So on top of my family, I was amazed at the support of good people behind someone completing something like this,” he says. Finally, the day of the ordination arrived. Weighted with the support of their communities, both men approached Bishop Wall, ready to become deacons. Cormack’s emotion at thinking of the ordination is a bit more subdued, thoughtful. 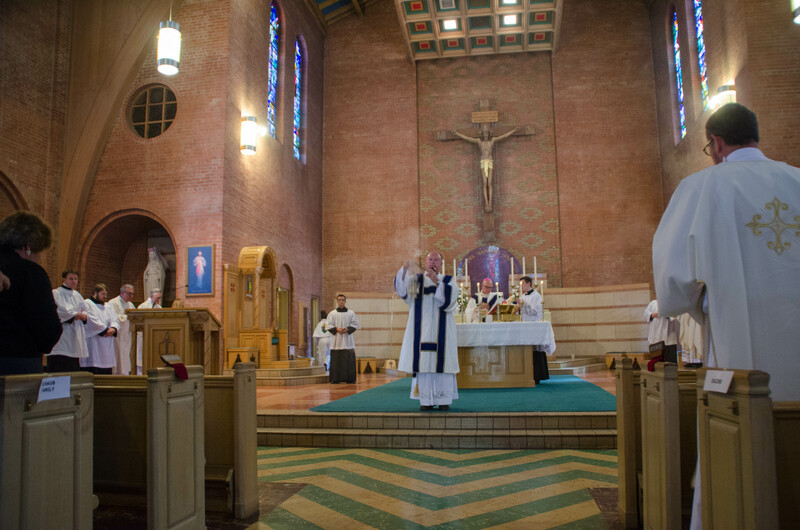 With his priestly ordination less than a year away, Cormack hopes to dedicate his time as a deacon fully to the people he’s met, to this place that has become his home. And he hopes that other men might take that step towards considering a vocation to the diaconate or priesthood. Cormack, now a deacon, blesses the congregation. As a permanent deacon, Schaub says he hopes to be a good preacher, or to lend his support to families at funerals. As a father himself, he also loves children. “I can’t imagine any greater gift, any more humbling, than to baptize a child,” he says. Now they will go forth in their new roles, to give back the love they’ve received. “I’m just ever so grateful, it’s hard to put in words the generosity and love of the people here, that’s been so good,” says Deacon Cormack. Deacon Schaub expresses similar feelings.